I really loved the last pesto I made recently with fresh wild oregano, which we picked from the mountain. You can use it not only in pasta dishes but also on grilled food or as a topping in many other dishes. It’s not the traditional pesto you all know but the basic ingredients are there: a herb (oregano instead of basil), garlic, extra virgin olive oil, nuts (walnuts instead of pine nuts) and cheese (feta instead of parmesan). Oregano comes from the ancient Greek word “origanon” (ορίγανον) from “oros”, which means mountain and “ganos” which means brightness. It is the plant that gives brightness to the mountain. It is a plant, a gift of nature, used either in cooking or therapeutically. It was considered a symbol of happiness by the ancient Greeks and the Romans, and for this the wreaths made in weddings also contained twigs of fresh oregano. This aromatic plant, found mainly in the Eastern Mediterranean is our health advocate because it is one of the most powerful natural antioxidants. It’s antioxidant power is 12 times stronger than an orange, 30 times more than a potato and 42 times more than an apple. This Greek-style pesto turned out delicious and matched perfectly in the white beans salad I made. Last week I cooked some beans and since I had some leftovers which I did not want to waste, so I freezed them. As I already said in other posts, I am using the word leftover a lot lately, as nothing is thrown away. I try and cook dried legumes as often as I can and white beans feature at least once a week on our table, as this is a versatile dish and everyone enjoys eating it, adding their favourite ingredients. So instead of making my usual bean salad, I thawed the beans and thought why not try it with pesto and see how it works. The ingredients I used were: boiled beans, cherry tomatoes, cucumber, onion, parsley, tuna, roasted red pepper, olives, seasoning and pesto. We loved it and this makes a very healthy and refreshing summer dish with legumes. 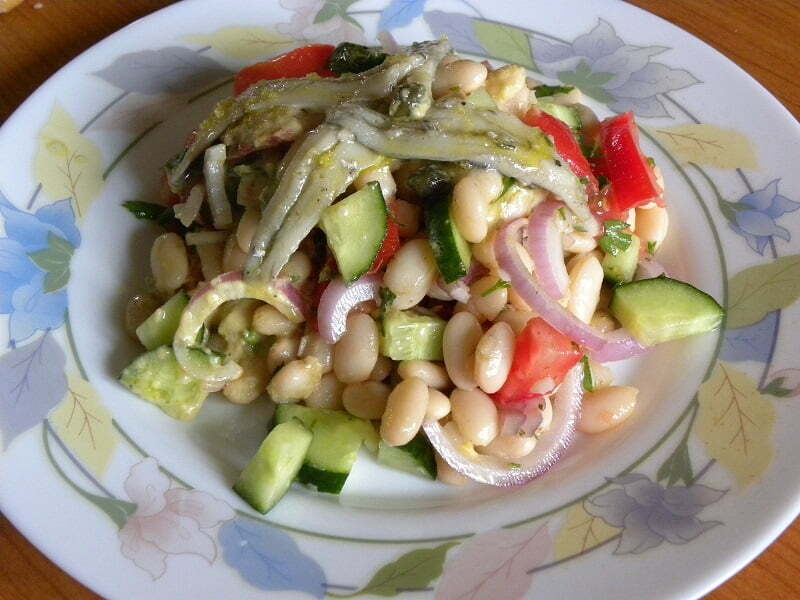 Ever since, I’ve made this beans salad many times, adding something different, depending on what I had at hand. This bean salad is with fresh, marinated anchovies and Purslane Pesto. Start adding the olive oil gradually. Stop to scrape down the sides of the food processor, if necessary. See how to cook the White Beans here. After boiling and straining the beans, add the remaining ingredients. Mix in the pesto and adjust salt and pepper if needed. Refrigerate for half an hour or more to allow for all the flavours to develop and for the salad to chill. Note: In order to make the recipe vegan, do not add the cheese to the pesto and leave out the tuna fish. Oregano pesto, with its bold flavour, can be used not only in pasta dishes but also on grilled food or as a topping in many other dishes. In order to make the recipe vegan, do not add the cheese to the pesto and leave out the tuna fish. That looks so good Ivy! The song you are playing..”Bubbly”, Gwen, Roberto’s daughter sang at our wedding! It was so special! I love hearing it again! I am glad that when you visit me you will have lovely memories. That was very sweet of Gwen to sing at your wedding. I love the song which is playing…you make me smile please stay for a while…..have been hearing it again and again really!! Hi Swati, I am glad you like the music. Next week I shall change the song. I love your photo. I visited your blog last evening (past midnight) and left a message but probably did something wrong as could not see it today. What a beautiful summer-time salad… and I so love pestos made with all sorts of herbs! Wow Ivy! You’ve been doing some improvements in your blog!!!! I love the widget announcing your event deadline… GReat idea! Just beautiful as always Ivy!! You have left me drooling! This salad looks super, Ivy! I like that with the beans and the tuna it makes a hearty meal, yet the cucumber, tomatoes, etc lighten it up so that it’s perfect for summer.